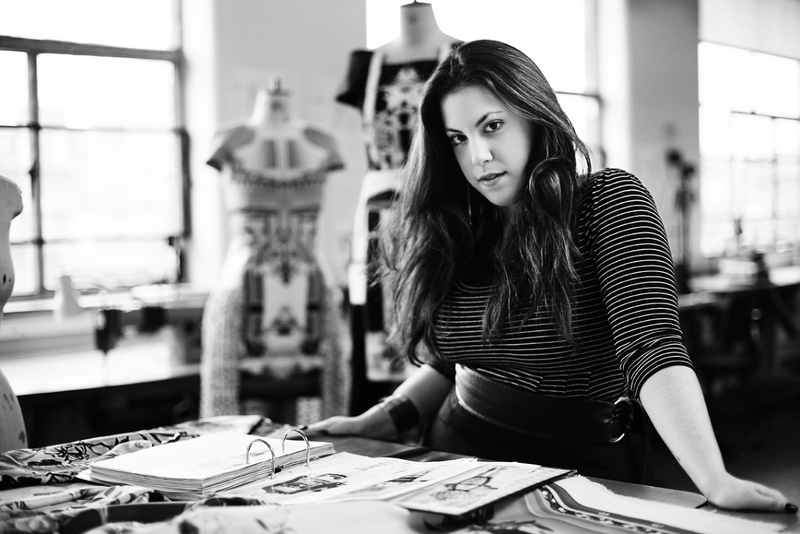 Why Does Mary Katrantzou Wear Black? Mary Katrantzou is known internationally for the bright, colourful prints that adorn the fabrics of her beautiful dresses. The prints brighten even the blackest of moods and as soon as you get a glimpse of a Mary Katrantzou dress, it entices you to look closer at the garment and examine every inch of it's surface. With the launch of her recent collaboration for Topshop, Mary was pushed into the spotlight once again but with all the media attention surrounding her colourful designs, I struggled to find one image where Mary was wearing just a smidgen of colour. Pages and pages of images littered Google but not one featured the designer in colourful clothes. After many fruitless searches, as to why we only ever see Mary dressed in black I have come up with a range of reasons as to why this may be. There appear to be three main reasons as to why Mary Katrantzou chooses to dress head to toe in black. The first and probably the most likely relates to a form of fashion detox...a cleansing of the mind and soul which allows Mary to continue to create her bright and bold prints. Delving deeper into this idea, I was faced time and time again with the quote from Mary herself, stating that the colour black "has become a uniform: when you work with so much colour, you just need to strip it all back to black". It is true. Mary is surrounded by fields of colour, day in, day out. It wouldn't be surprising if she even dreamt about colours. By wearing black, she is providing herself with a mental break, a chance to be free from the colour clashes and the intense hues that make her work so popular. Mary is also creating a physical barrier between herself and her work. Covering herself in black separates her from her designs and stops her from being defined by her work. After all, Mary Katrantzou is just a brand, whereas the human Mary Katrantzou is a woman full of emotions and personality which form a completely different aspect to her life than her design work. Exploring what Mary Katrantzou was like during her formative years, leads to another discovery as to why she wears black. In an interview with the London based newspaper, The Evening Standard, Katrantzou explains that she has "always worn black since (she) was 15 and went through a grunge phase of all black and Doc Martens." Mary goes on to explain that she thinks it was because her Mum was matching her outfits when she was young making her want to break out and have her own sense of style. Everyone goes through a rebellious teenage phase, I remember mine and thankfully there are only a couple of photos bearing the evidence. Think pink striped tights and zipper tops-not stylish!! Mary's drive to break away from conventional beliefs and a safe way of living has undoubtedly shaped the person she is today and who knows-would she still have become the UK's most coveted designer if she let her mum dress her? Finally, it has always been said, you can tell a lot about a designer from the exit they give to their shows. Bold, outlandish designers always strut their stuff down the catwalks, joining the models in the parade. 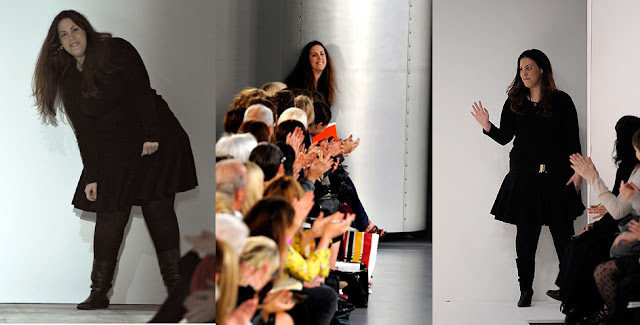 Shy, reserved designers on the other hand, are renowned for a small lean out of the wings, or a timid wave to the audience. Looking through the Mary Katrantzou show archive on style.com, Mary is a mixture of both. Half of her shows end with a shy wave, whereas a select few end with Mary on full show, beaming with happiness and giving a full wave to the audience. Black clothes are synonymous with the fashion crowd. It has become a joke now at fashion week that if you wear all black, you must work in PR. Wearing head to toe black also can be a sign of insecurity, lack of imagination and boredom. From looking at Mary's designs, I highly doubt that she is bored or unimaginative, most probably the complete opposite. Insecurity, caused by anxiety is a crippling disorder, inflicted upon the most creative people, as well as others in the world. By wearing black clothing, a person slips into the background and becomes unnoticeable allowing them to escape from the world in which they are living in. An underlying reason why Mary wears head to two black could be linked to the feeling of insecurity or the difficulty she faces in accepting her overnight fame and success. Despite this, with the ever increasing hype surrounding her latest collection it is important to remember that Mary, although in control of a world famous fashion brand, is just a normal human being with the same insecurities and worries as you and I face in our everyday lives. The fresh bursts of colour that form a crucial part of Mary's work tap into the imaginations of thousands across the globe and provide a luxury that no other British brand has managed to achieve so far. At the moment, I can confidently say I am glad Mary is wearing lots of black-her collections get better and better each season and the response she is receiving from her work is phenomenal. Maybe black clothes are the secret to her ever growing success? !